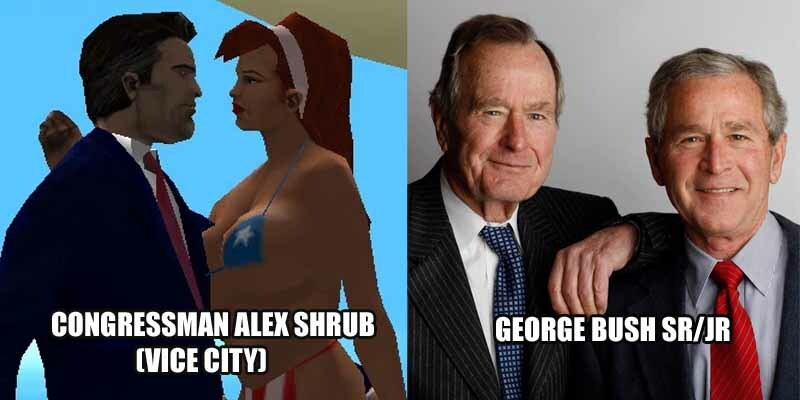 There is a common (but unofficial) perception that Alex Shrub from Vice City is a caricature of former U.S. president George H. W. Bush and Florida governor Jeb Bush. In addition to their political learning and similar last names, bush and shrub are both kinds of plants, Congressman Shrub’s voice is also very similar to that of George H.W. Bush. “Shrub” is also in use as a nickname For U.S. president George W. Bush popularized by Texas columnist Molly Ivins. As if that’s not enough, Alex Shrub is a Congressman looking to be President. In addition, many of Shrub’s political positions appear to be exaggerations or parodies of stereotypically “right wing” positions, such as his claim on VCPR that poor people deserved to be stupid. Conversely his depiction as a young and attractive philanderer is a reference to liberal Democrat and former U.S. president John F. Kennedy.